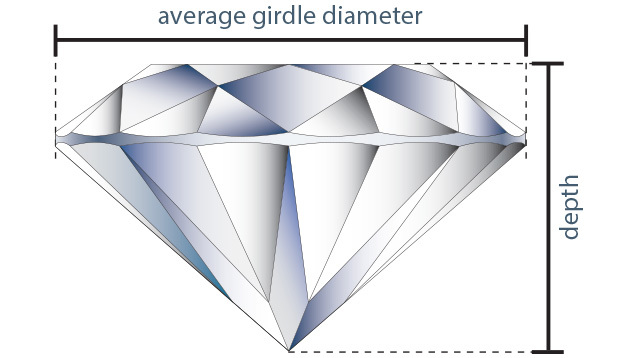 This graphic illustrates the measured and visually assessed proportions that affect a round brilliant diamond’s cut grade. A specific set of terms is used to describe parts of a polished diamond. Each part of a diamond makes its own contribution to the diamond’s appearance. In the standard round brilliant, there are 57 or 58 facets. The table facet, usually the largest facet on the diamond, helps gather light from above and either reflects it back to the observer or directs it into the diamond’s interior. The crown facets, consisting of 8 bezels, 8 stars and 16 upper halves, gather and disperse light to create brightness, fire, and a scintillating pattern of light and dark. The pavilion facets, consisting of 16 lower halves, 8 mains and an optional culet, reflect the light back through the crown to the viewer’s eye. All of these facets work together to create each diamond’s unique appearance. The diameter of a round diamond is the distance from one girdle edge to the opposite girdle edge, straight through the centre. 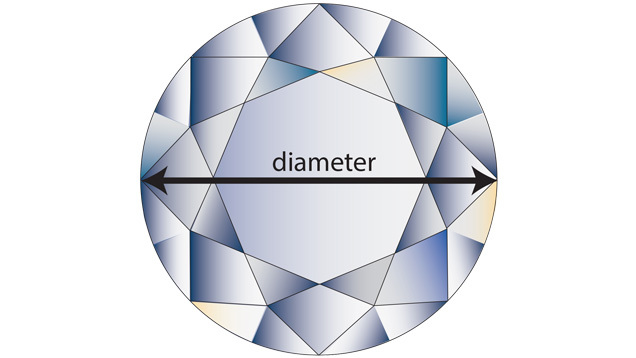 Because even well-cut round diamonds are never perfectly round, the diameter is measured in several places, recording the minimum (smallest) and maximum (largest) measurements. This proportion is used in calculating certain percentages such as table size, total depth, crown height and pavilion depth. 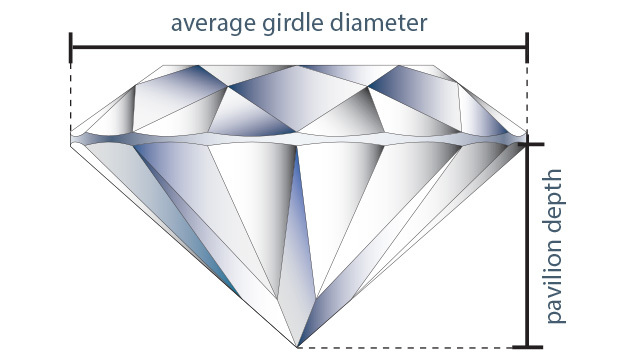 The total depth percentage of a round brilliant diamond is the table-to-culet depth, expressed as a percentage of the average girdle diameter and reported to the nearest tenth of a per cent (0.1%). 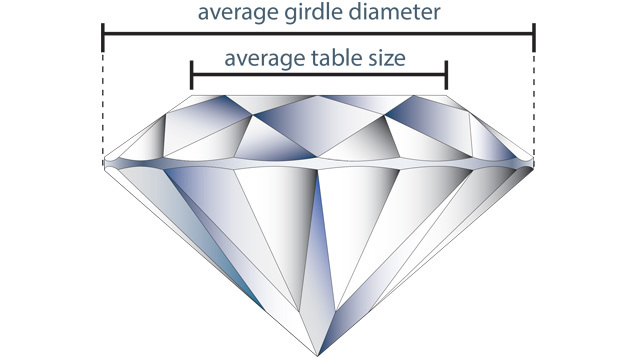 The table percentage of a round brilliant diamond is the average of four table measurements (from bezel point to bezel point) expressed as a percentage of the average girdle diameter. It is reported to the nearest whole per cent (1%). Star length percentage is the length of the star facet expressed as a percentage of the girdle-to-table distance. The average of the eight star length percentages is reported to the nearest five per cent (5%). 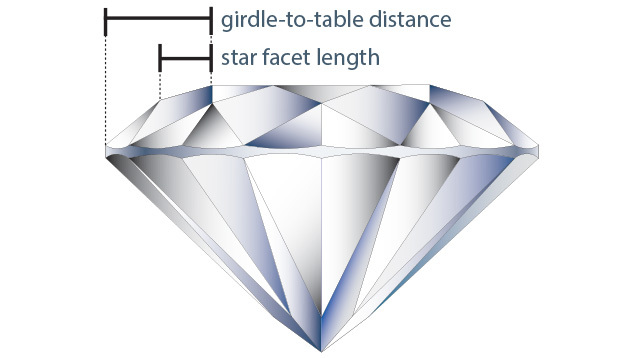 Star facets that are very short or very long can have a negative effect on a diamond’s face-up appearance. Crown angle is the measured angle between the bezel facet plane and the table plane. The average of eight crown angle measurements is reported to the nearest half of a degree (0.5°). 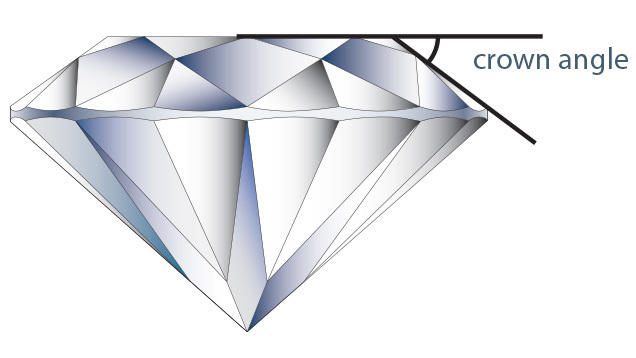 Crown angle can significantly affect a diamond’s face-up appearance. 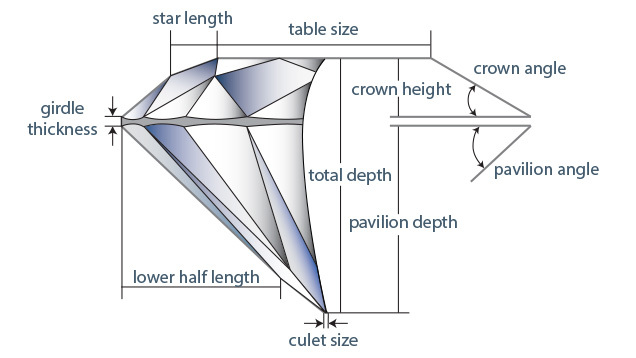 Generally, crown angles from 32 to 36 degrees produce attractive, bright and fiery diamonds if combined with the right table percentage and pavilion angle. 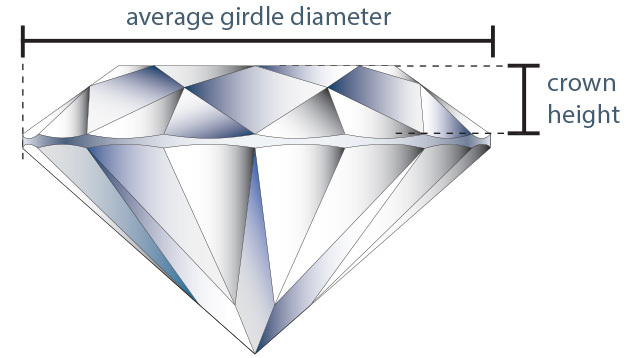 Crown height percentage is the diamond’s crown height, measured from the table to the intersection of the bezel facet and the girdle, expressed as a percentage of its average girdle diameter. It is reported to the nearest half of a per cent (0.5%). Pavilion angle is the measured angle between the pavilion main facet plane and the table plane. The average of eight pavilion angle measurements is reported to the nearest 0.2 degrees. Subtle pavilion angle differences can have a significant impact on the diamond’s face-up appearance. For instance, steep pavilion angles can produce dark areas under the diamond’s table. 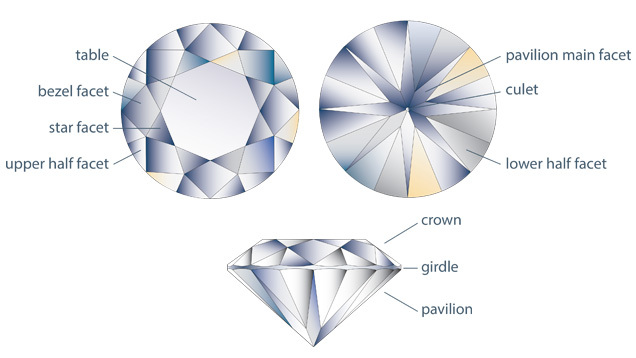 Pavilion depth percentage is the diamond’s pavilion depth, measured from the culet to the intersection of the pavilion main facet and the girdle, expressed as a percentage of its average girdle diameter. It is reported to the nearest half of a per cent (0.5%). Lower-half length percentage is the length of a pair of lower-half facets expressed as a percentage of the girdle-to-culet distance. The average of eight lower-half length percentages is reported to the nearest five per cent (5%). Lower-half facets that are very short or very long can have a negative effect on a diamond’s face-up appearance, especially its pattern. 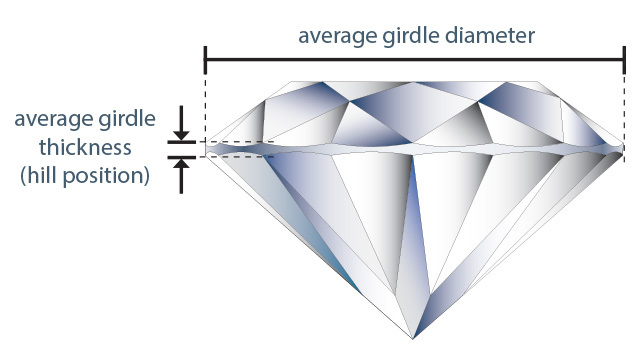 Girdle thickness percentage is the average thickness of a diamond’s girdle, measured at the eight bezel/main “hill” positions, and expressed as a percentage of average girdle diameter. Hill positions are the “thick places” located where the bezel and main facets meet. It is reported to the nearest half of a per cent (0.5%). Girdle thickness is visually assessed at the "valley" positions, as a range between the thinnest (minimum) and the thickest (maximum) areas. Valley positions are the "thin places" located between the bezel/main intersection and where the upper and lower halves meet. Descriptions of girdle thickness include extremely thin, very thin, thin, medium, slightly thick, thick, very thick and extremely thick. Thinner girdles can affect the diamond’s durability, whereas thicker girdles can hide unnecessary weight. The cut grade can be lowered in both of these cases. When the angles and positions between the upper- and lower-half facets are normal in relation to the bezel and main facets, the facet junctions are distinct and the girdle is evenly scalloped. This illustration shows a normal girdle. Painting refers to the tilting of the upper- or lower-half facets toward the bezel or main, resulting in thinner “hill” positions where the bezel and main facets meet. The angle of the upper- or lower-half facets is reduced, becoming close to the angle of the bezels or mains, and blurring the visual distinction between them. The top illustration shows painting on the crown. The bottom illustration shows painting on the pavilion. Digging out is the opposite of painting. 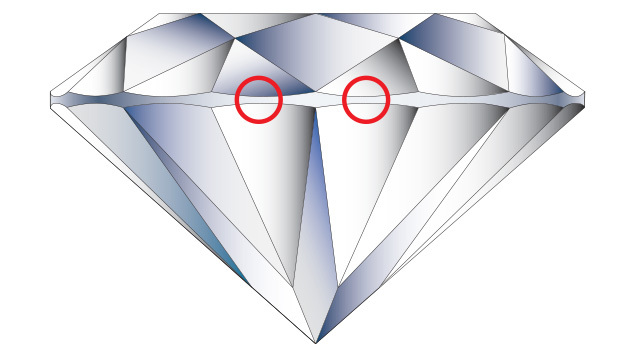 The upper- or lower-half facets, or both, are tilted away from the bezel or pavilion facets and towards each other, resulting in thinner “hill” positions where the upper- and lower-half facets meet. The angle of the upper- or lower-half facets is increased, and the junction between the half facets becomes visually indistinct. The top illustration shows the crown with digging out. The bottom illustration shows the pavilion with digging out. 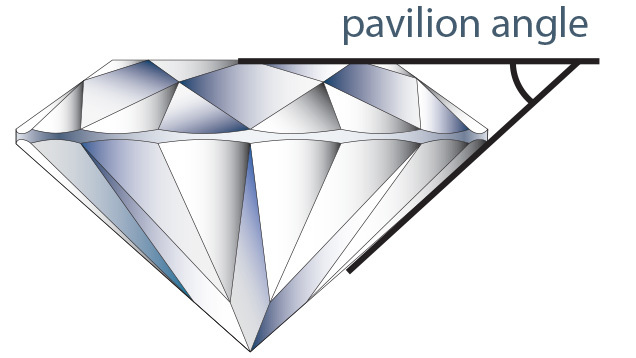 Painting and digging out can occur on a diamond’s crown, pavilion or both. 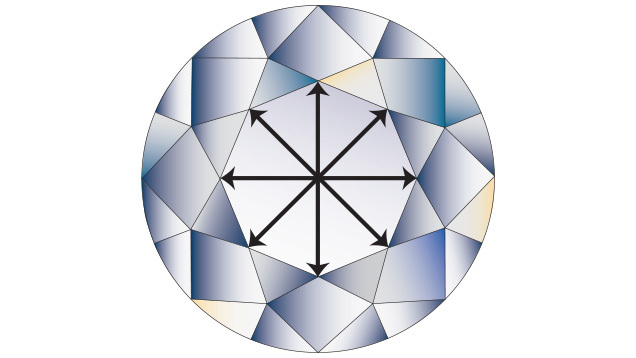 Both painting and digging out are used to retain weight, and can have an impact on a diamond’s brightness and pattern. As these features become more severe, so do their impact on the cut grade. 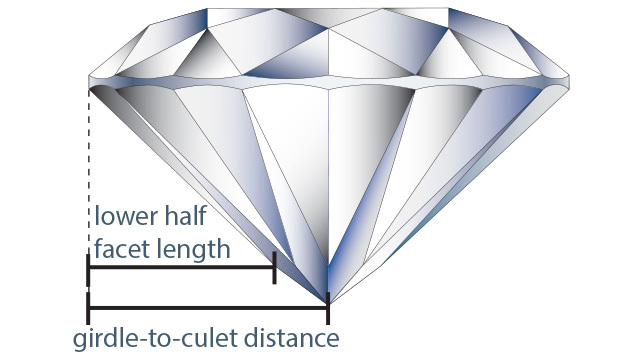 Culet size is described as the width of the culet facet, when present, relative to a round diamond’s average girdle diameter. Descriptions include none, very small, small, medium, slightly large, large, very large and extremely large. "None" is used when there is no culet facet, which is sometimes referred to by the trade as a “pointed” culet. 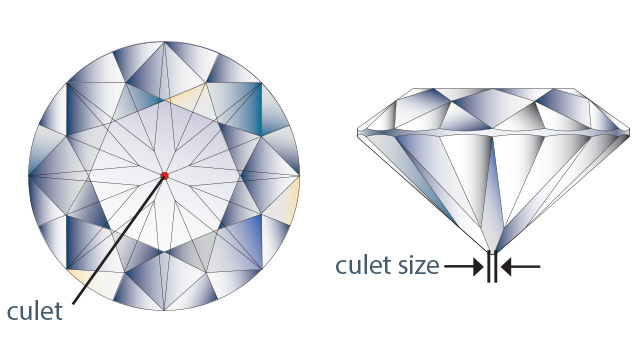 Larger culets can have a negative effect on the diamond’s face-up appearance, specifically affecting its pattern, and lowering its cut grade. You’ve heard about the 4Cs of diamond quality (colour, clarity, cut and carat weight). But how did they become so well-known? Here’s a little diamond history. Shane McClure discussed the unique finds he has seen during his time at GIA at the AGS Conclave in San Diego. Enter a world not well-known in the West—the world of the maharajas and their jewellery, coveted by the modern-day moguls of business, entertainment and royalty. See the fantastic works of art made today in the form of enamelled Kundan meena jewellery and the regal look of polki diamonds.